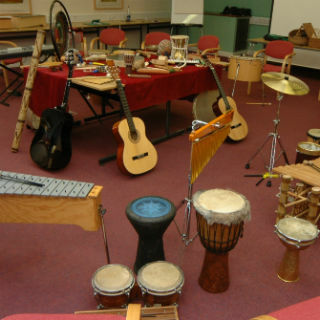 Music therapy is the use of musical instruments/equipment and the sounds they make to promote change and recovery. Music can communicate where words fail, making it an ideal medium for exploring experiences and feelings, which may initially be too hard to verbalise. Music therapy is an effective alternative to counselling and psychotherapy, especially when people are finding verbal communication difficult or inadequate, or having problems relating to others. Read more about how music therapy supports mental health. The therapist improvises music with clients in a way that supports, encourages and contains their music/sounds. Self-expression and interaction are invited and facilitated. This evolving, therapeutic relationship is central to how music therapy works. If music therapy is happening in longer-term groups, trust and understanding between group members in the sessions can also develop. These group relationships, supported by therapists, can be useful in recovery, offering insight, hope and motivation. You can find out more about our services here or read more about what to expect from one of our music therapy sessions here. To find out more about music therapy in the UK, visit the British Association of Music Therapy website.